In order to install OpenBSD on this board, you will need to access the serial console. This is a 3.3 Volt RS232 serial console, and connecting this with a 12 or even 5 Volt serial port will be fatal for the board. You need an USB F-cable to connect the BeagleBone Black serial port to your laptop or computer. 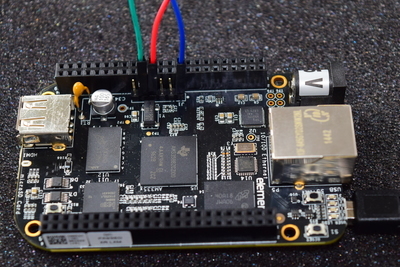 Locate the pins of the serial board on the BeagleBone Black. The white dot is next to pin 1. Boot the board and check that you see the startup-messages. For the BeagleBone Black you need the miniroot-am335x-57.fs installfile from one of the OpenBSD ftp-mirrors. This step is optional, just to make things easier. I put these files on a local webserver, so during the install the installation program can fetch these files from the local network. I didn't bother to download any x-sets, this board will be running headless. Now the hard work is done. Put the micro SD-card in the slot on the board. Locate the small switch on to top-side of the board, close to the micro SD-card slot (on the bottom-side). Keep this switch pressed while putting power on the board. The board will now attempt to install from the external micro SD-card and not from the internal eMMC-flash storage. The OpenBSD installer will start. Just follow the installation procedure, I choose the defaults for the partitioning of the SD-card (it is sd-card 0). After the installation is done reboot. After the reboot, login again via the serial cable and have a look around your fresh OpenBSD system. To protect the life of the SD-card, we are going to make it readonly. Make sure your network configuration is right, ssh is hardened and your ~/.ssh/authorized_keys has the right contents. Make a directory /proto and copy /var and /home to it. Above, 4a6b4c0ba6c86953 is the uuid of the micro SD-card. Each of the last three lines will make a memory file system (MFS) and populate that with the corresponding subdirectory from the /proto diretory. Reboot and check everything works fine. In this case / gets remounted read-write.